The Matilda oyster pleated faux silk 20-inch table lamp shade, suitable for a large table lamp, fitted with fixed BC gimbal suitable for use with BC – B22 and SES – E14 lampholders only. A 20-inch pleated, tapered shade hand made in white lined beige organza fabric and available in other sizes. 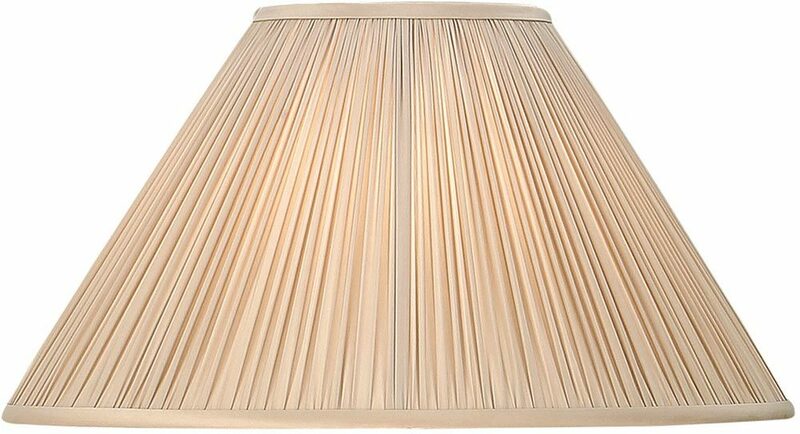 The Matilda oyster pleated faux silk 20-inch table lamp shade, maximum impact for minimal outlay. Does this lampshade come in other colours? Also is it suitable for a carrier i.e. Inside ring resting on carrier 11 cm? It is the nearest I have been able to find as a replacement for a pale green silk shade that has lost its lining.